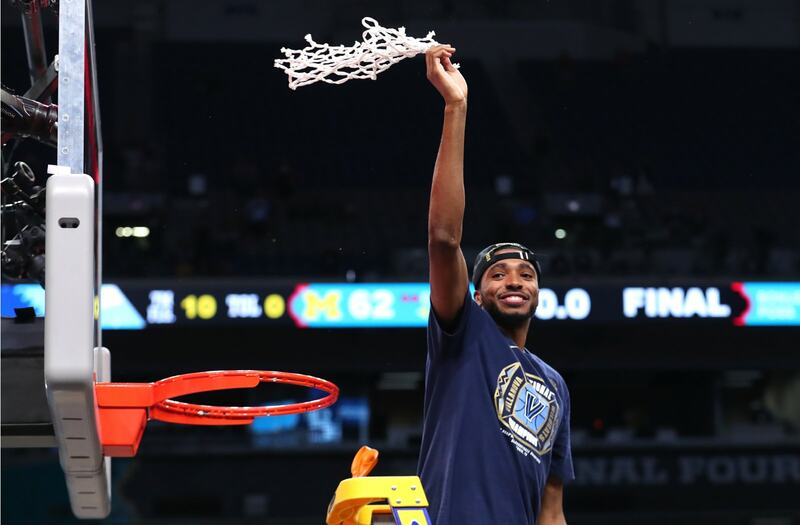 Mikal Bridges wasn't the best player on his national championship Villanova team. That was Jalen Brunson, who went on to be named the collegiate player of the year. Bridges wasn't the pressure player for the championship. That was another teammate, Donte DiVincenzo, who kick started the biggest game with 18 of the team's first 32 points and 31 overall to get the Sports Illustrated cover. 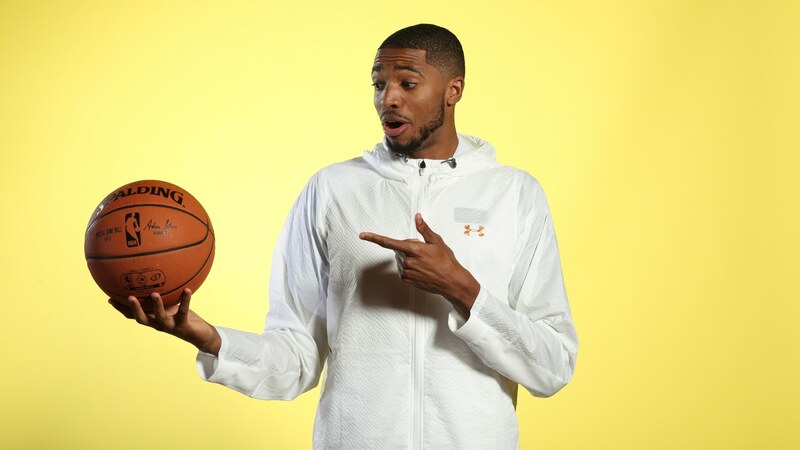 But Mikal Bridges is likely to become the wealthiest because despite being overshadowed by at least two current teammates and perhaps a half dozen in his four years at Villanova, the versatile 6-7 forward is about to become one of the highest ever drafted Villanova players, a sure lottery pick in the June 21 NBA draft. Will it be by the Bulls with the No. 7 pick? The Bulls Monday get an up close look at Bridges, who is working out at the Advocate Center along with Duke center Wendell Carter Jr. They probably will not perform against one another. But the Bulls figure to have seen plenty of the rangy wing man through two title runs with the Wildcats and his own remarkable growth from a redshirt freshman who was too thin and weak to play against varsity players like Ryan Arcidiacono to the modern archetype of the NBA small forward, a long armed defender who can switch onto four positions with exceptional long distance shooting range and a high level basketball IQ. Is that you, Chicago Bulls? "I bring winning to your team," Bridges told ESPN. "I learned about that at Villanova, what is a winning championship atmosphere and what you've got to do to achieve it. You have to always be locked in. Two championships in three years; not a lot of people have done that." There's little doubt Bridges can be a big part of winning. But can he contribute enough as a high lottery selection? That's one of the questions the Bulls are trying to answer as they consider the highly regarded wing player. Bridges isn't the most celebrated at that position in this draft. Most consider Europe's Luka Doncic as the best playmaking forward, though not as good defensively. Then there are concerns about Michael Porter, who has been rated athletically higher than Bridges, but who had back surgery and has some vague shadow of doubt regarding his fraternity. Not so with Bridges, who as a freshman recognized his own shortcomings and even suggested a red shirt season. "I don't know of a kid would wouldn't want to play at this level right away," Bridges told reporters in Philadelphia. "But the redshirt idea made sense for me and my family. I was young for my grade, too. So I stuck with it for the year and kept improving, getting better and stronger." Bridges' coaches have raved about his willingness to learn, sacrifice and improve. Said Villanova's Jay Wright: "A lot of guys say, 'I want to be great, I want to be great, but I don't want anybody changing my shot. I don't want anyone challenging my toughness or my effort, but I want to be great.' This is why I think Mikal's going to have a great NBA career because one of the challenges of getting to the NBA is, once you start making a lot of money, do you stop getting better? Do you stop listening to people coach you? He wasn't raised that way." Bridges has his own unusual background, a suburban kid raised by a single mother who had him when she was 19. Yet his mother, Tyneeha Rivers, went from menial jobs to support the family to a master's degree and human resources work for the company that manages the NBA 76ers, the NHL Devils and the Prudential Center. Plus, Tyneeha said in a national interview she has a long wingspan. "I bring winning to your team. I learned about that at Villanova, what is a winning championship atmosphere and what you've got to do to achieve it. You have to always be locked in. Two championships in three years; not a lot of people have done that." Yes, the long wingspan, a favorite measurement of NBA teams. It worked for wing players like Scottie Pippen and Kawhi Leonard, to whom Bridges has drawn some comparisons with his 7-2 wingspan. Though also to Tony Snell and his seven-foot wingspan. In NBA draft reviews, Bridges has most often been likened to the Wizards' Otto Porter. Who, by the way, was a No. 3 overall pick. Bridges is about 6-7 and a slight 210 pounds, though his measurements are unofficial since he didn't attend the NBA combine. He was getting his college degree, it seems. Which is a good thing because it demonstrates his eagerness to learn and responsibility. But also is not always a great thing in the NBA since Bridges is one of the oldest players in the draft, turning 22 this summer, the presumption then being he doesn't have much more room to develop. Though Bridges has come far since his freshman year when he was variously known by his teammates as Noodles, String Bean and the Praying Mantis. Bridges added almost 40 pounds in college and about 300 pounds to his lift, which as a freshman was closest to what the reporters lifted in the gym. But it's been with his play that Bridges has raised the bar, a player who is virtually the prototype of the ideal NBA player. Bridges shoots with accuracy from three-point range, recording 43.5 percent in his third and final playing season. He shot more than 91 percent on free throws in his second season. He averaged 17.7 points last season with just under 12 attempts per game. Which is good and bad. He's an efficient scorer, but he's not demanding of the ball. He's not the kind of player who will or can isolate and score, more like Luol Deng as a slasher, cutter and spot up shooter. Like Deng, Bridges was not regarded as a strong finisher with a limited number of free throw attempts. But he's often been a highlight dunker with his quick jumping. Bridges is not the vocal leader type, supposedly a bit on the shy side, though aggressive with his game, especially on defense. 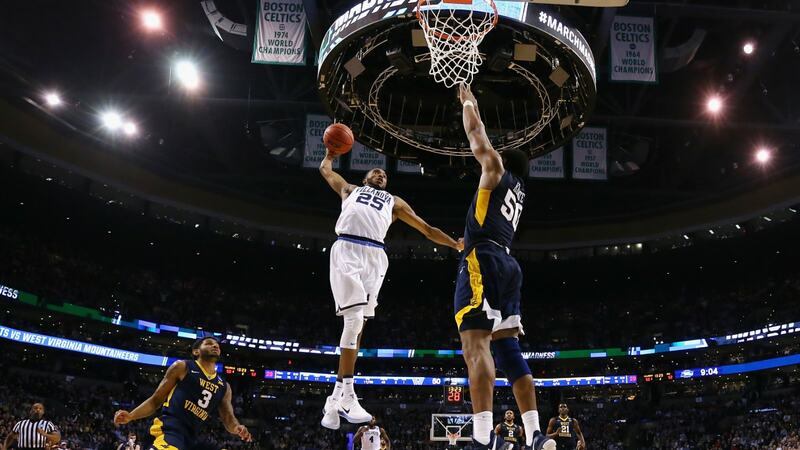 He played the point in Villanova's successful pressure trap, the kind of bold defender who could team well with someone like Bulls point guard Kris Dunn. Bridges averaged almost two steals per game and more than one block. Bridges often defended all five positions in college and is regarded as a four-position defender and perhaps even five in the NBA the way many teams don't use centers. 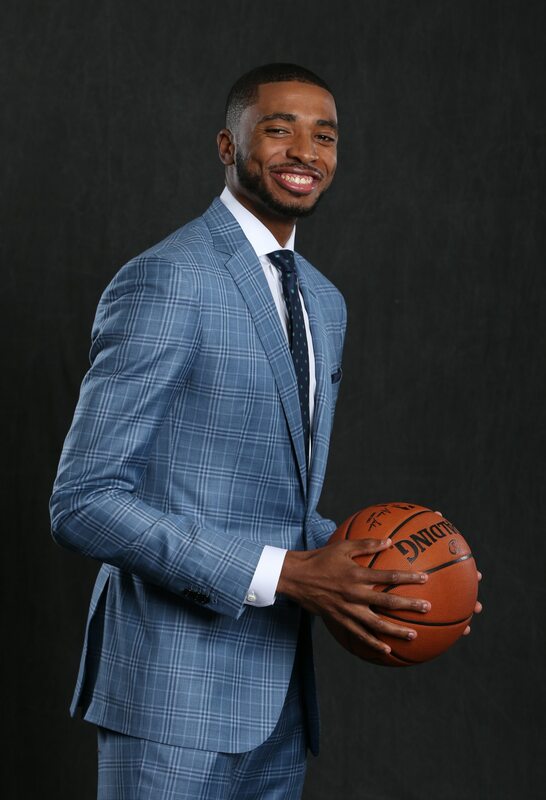 He measures as the sort of player the Golden State Warriors would pursue with long distance shooting ability, offensive movement, long armed with the ability to switch and play out of pick and roll. Players of that sort often have have been selected late in the lottery, like Paul George 10th and Klay Thompson 11th. They don't look like individual stars, but they can do the things so many teams require, especially in this modern era. "I try to lead by doing all the little things," Bridges told the Big East network. "Let the young guys watch me do all the little things and they know if our captain is doing that, then they're going to do the same thing."